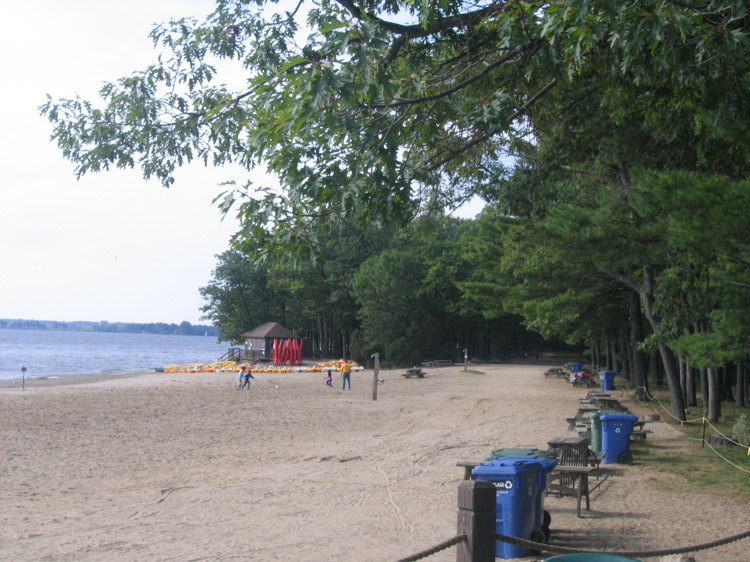 Oka park is just 40km from Montréal and offers a mix of a beach and forest trails. 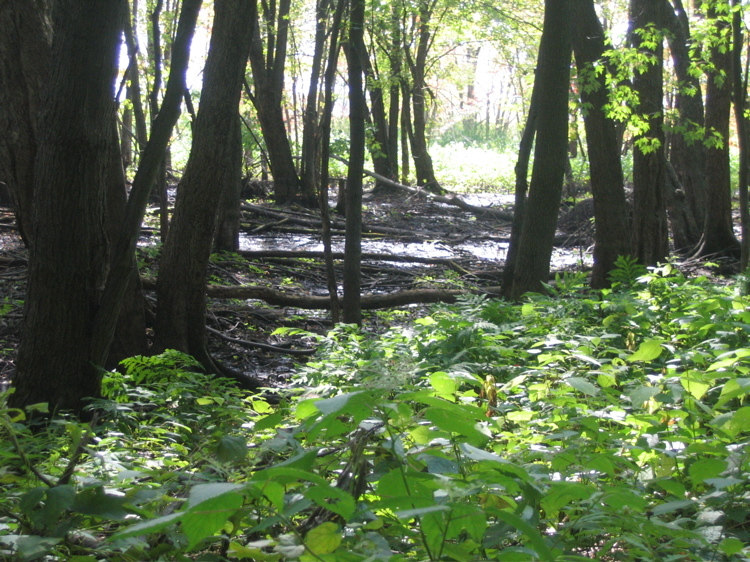 It’s part of the Sépaq network of national parks in Québec. The beach area is one of the prettiest that I’ve seen in Québec. 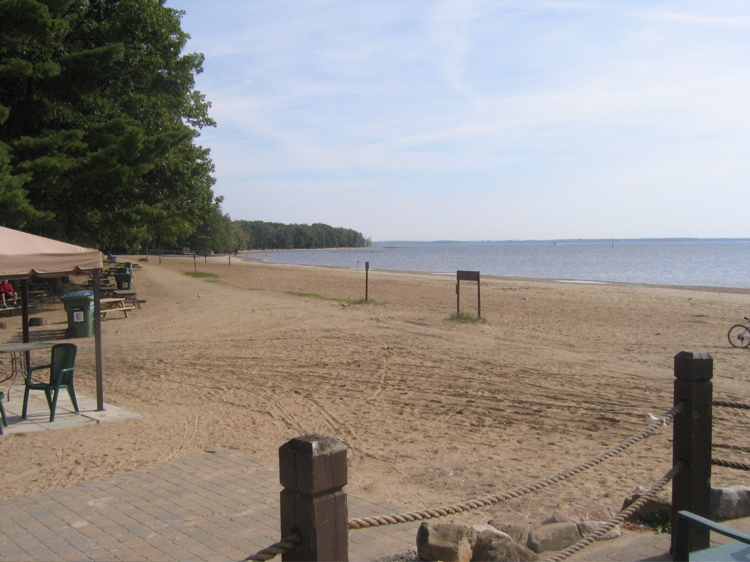 There is a magnificient and clean sandy beach on the Lac des deux montagnes. There is a service centre here with a restaurant and a shop, although it’s probably better to bring your own food as the quality is quite poor. It’s very much junk food oriented and there is little for vegetarians. The car park is just next to the service centre and the beach – a row of mature trees seperates it so once on the beach you don’t know it’s there. The car park is big, but on a hot July day I can imagine that it gets pretty busy. 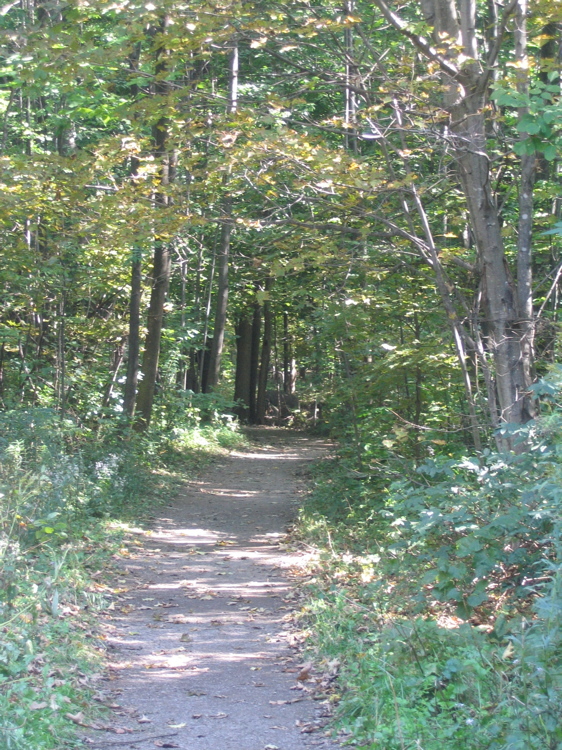 Oka park has lots of hiking trails too. If you’re a casual walker, you probably want to do the 3km Grande Baie trail. To get to the start you’ll have to take your car and drive to another service centre (see the map). 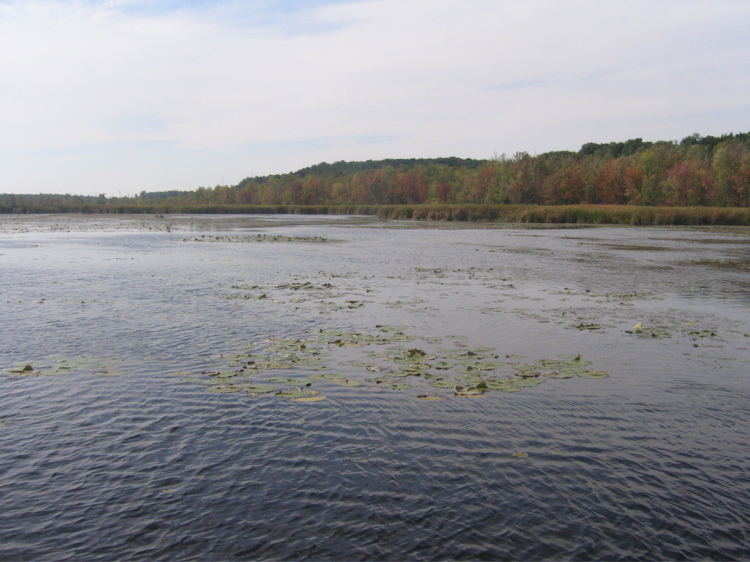 The Grande Baie is a large marsh land lake with beautiful views of reeds and trees and Canada geese flying overhead. The trail is marked as easy and it is quite so. There are three or four steepish hills so it’s not totally flat, but otherwise it’s as described. We went around with an umbrella buggy/stroller and found the going okay until the last 500m where there were a lot of rocks and we had to push hard. The reward at the end of the trail is the observation tower which gives fantastic views and photo opportunities over the bay. 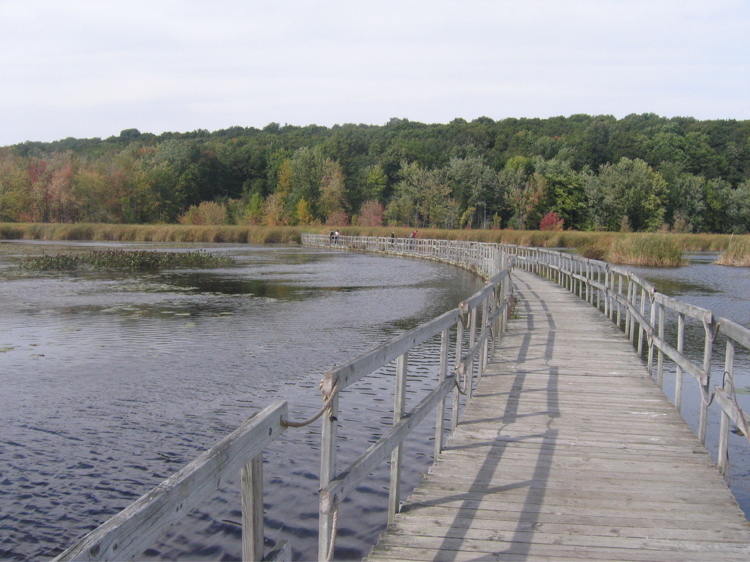 In addition, there is a jetty that goes out into the lake. First you walk through the reeds and then suddenly you’re walking just a few centimetres above the water. It’s truely amazing and awe-inspiring. Canada’s natual landscape is breathtaking! All of this just 40km from Montréal. Wow! 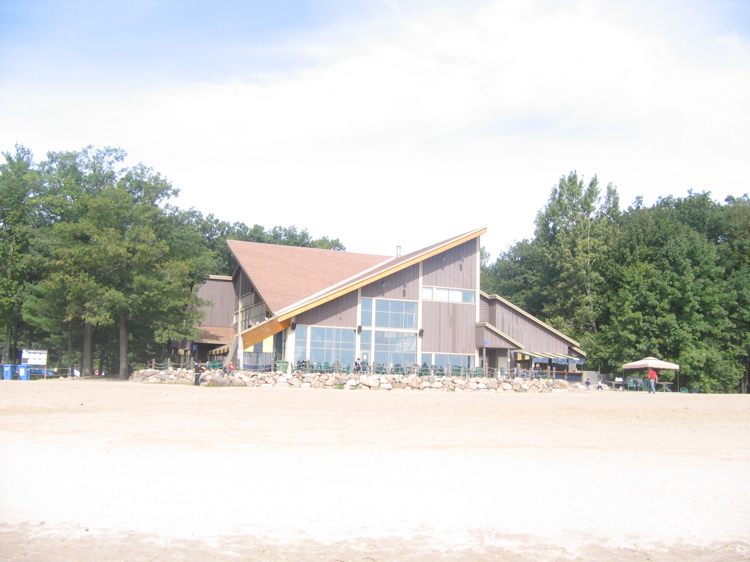 Oka park is an excellent destination for a day trip from Montréal with the family. As well as hiking you can also take your bikes (or rent one from the service centre) to visit one of the many trails. There are also canoes and pedalos for hire on the beach. It’s the Labour Day holiday here in Canada and that marks the beginning of the apple picking season. For a great day out, you can drive down to the south west of Québec and visit one of the many orchards on the Route de la Pomme / Apple Route. 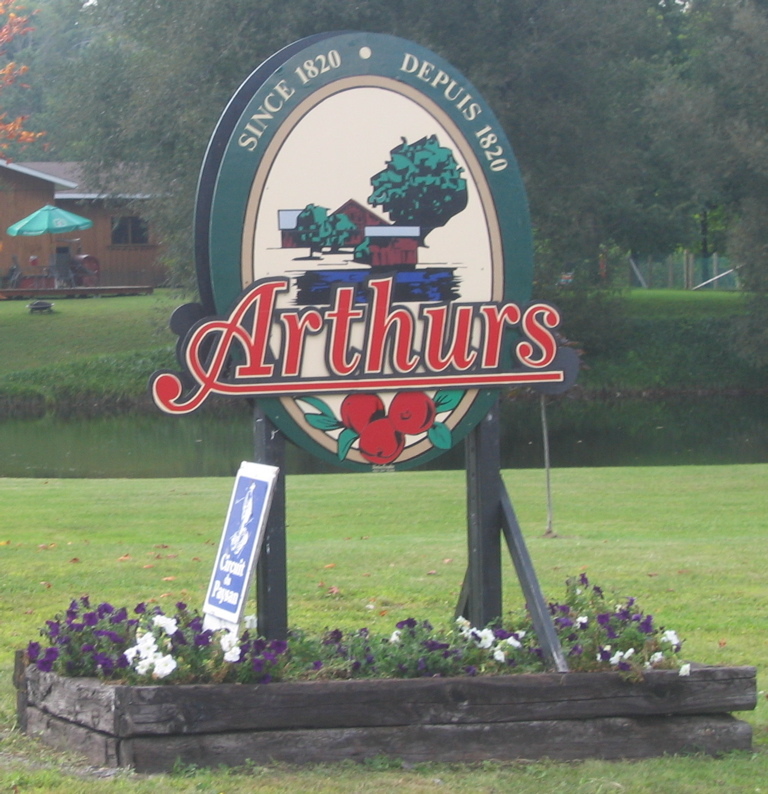 We visited Arthur’s Orchard which specialises in apples and maple syrup. Arthur’s has a “U-pik” area in between maple trees and corn fields where you can pick your own apples in a quiet country environment. The rows of trees are all labelled with the different varieties of apples that are offered by Arthur’s Orchard. Then you can visit the cafe and shop, pick up a homemade soup or a sandwich and then take a slice of great freshly made pie. When we were there, three soups and two kinds of sandwiches were available. Of course, as the sandwiches are freshly made, you can choose what you’d like on them. The huge lawn is a wonderful place to sit and relax in beautiful surroundings whilst the kids play in the play area. There is a pretty pond with a small covered walkway from the ample car park to the cafe and lawn. All in all it’s a great afternoon out on the Route de la Pomme and a very child-friendly one too! Arthur’s Orchard will welcome you from the beginning of September through till the end of August. 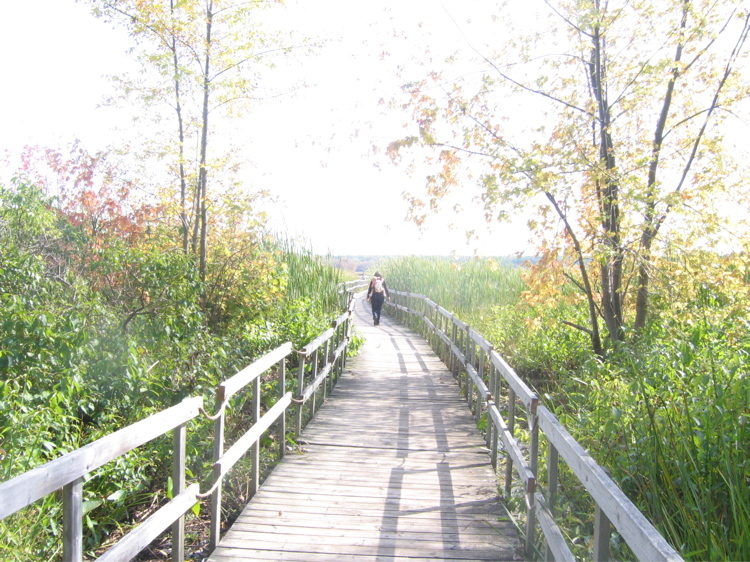 The sun was shining, it’s the weekend, what’s more Canadian that escaping the city to find the countryside? With that in mind we ventured out of Montréal to the Eastern Townships (Cantons de l’Est or Estrie in French). 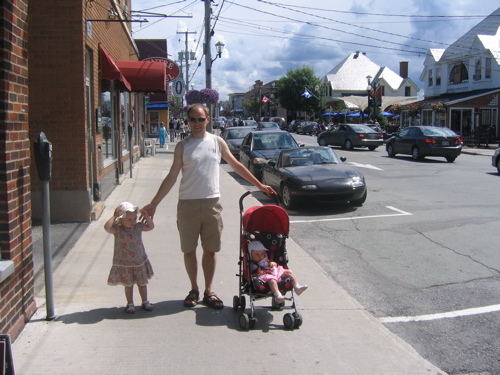 Not really knowing them too well, we chose Magog, one of the better known towns. 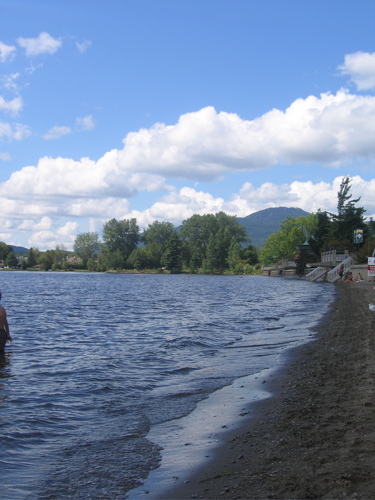 Magog is on the Northern edge of lake Memphrémagog who’s southern end stretches into the US. It’s a quaint and very touristic town, really with one main street full of cafés, restaurants, ice-cream parlours and clothes shops. Really nice for lunch and a mooch around. Walking along the main street you come to the lake. There’s a nice big childrens’ playground with is very well maintained (like all I’ve seen in Canada). 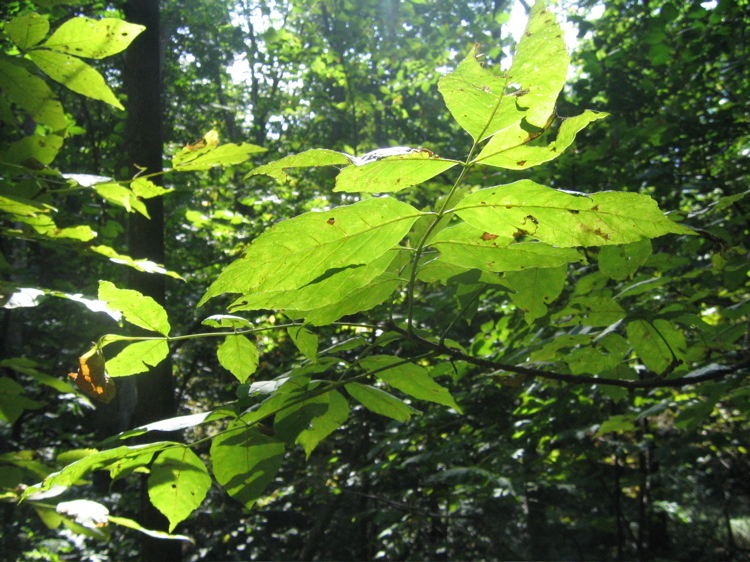 In the same area there are lots of picnic tables, trees for shade and groups of Canadians meeting up with friends. 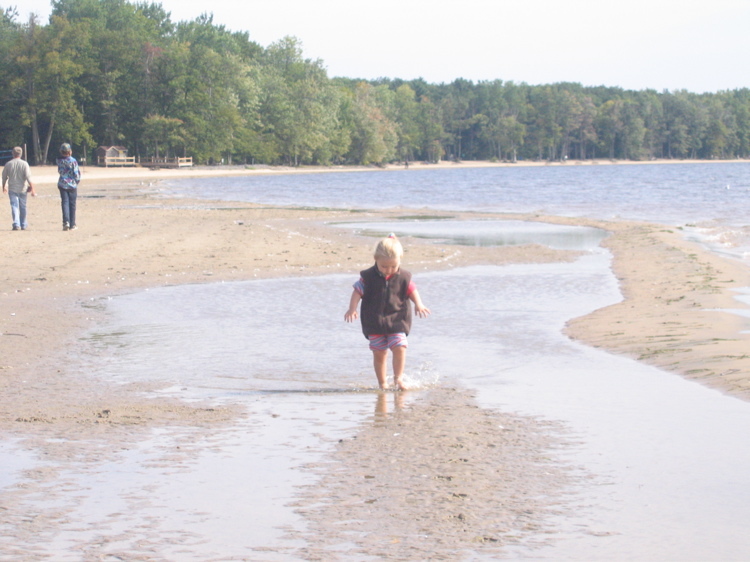 Walking a bit further, you come to the small stretches of beach. The sand is quite coarse and dark, but it’s sand and when the sun is shining, the lake’s water lapping in your ears, it’s great. 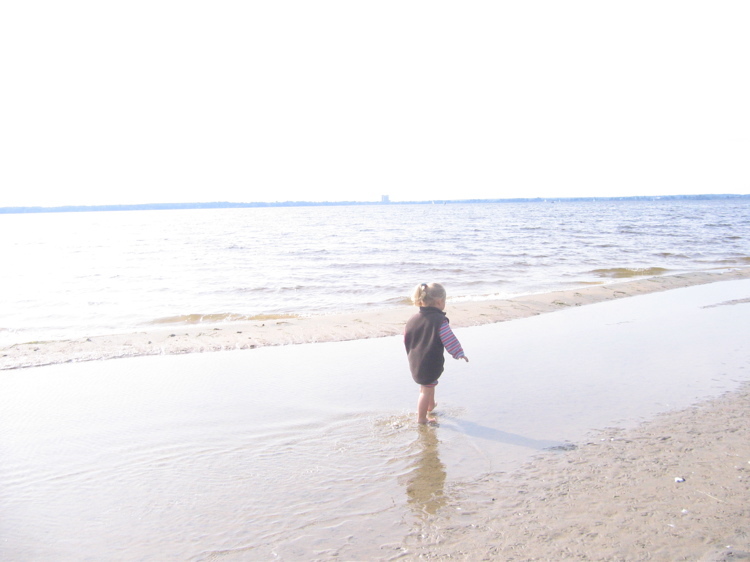 The kids love paddling there too. Magog even provide life-guards! There are lots of bikes around Magog and their occupants seem to love peddling gently along the promenade which is split between pedestrians and cyclists. Walk a bit further and you’ve left town! Well, not quite. On the edge of Magog is the infotourist cabin. It’s well worth stopping off and having a look at what’s on offer. It’s well stocked with leaflets and the staff are very friendly. 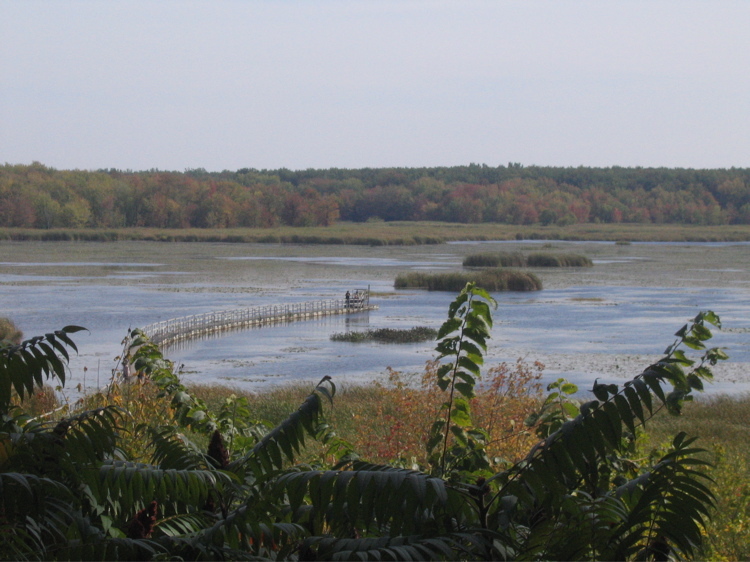 Of course the main attraction in the Magog area is the Mont Orford national park, but that will be for another post.